The International Accreditation Organisation (IAO) granted full accreditation to Academy of Vocational and Professional Training Ltd., UK, after meeting their rigorous Points Profile© System. Article by Diane Shawe M.Ed. In February 2012 AVPT Ltd gained Candidacy Status after complying with the first stages of the assessment criteria. Full accreditation was granted to the institution, after the IAO’s evaluation commission evaluated the school’s on-line Learning Management System, (LMS) on-line academic courses, supporting Virtual Facilitators and organisational and management structure. 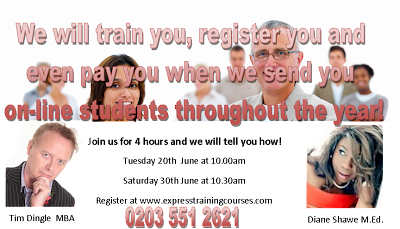 The Academy of Vocational and Professional Training Ltd. delivers over 240 courses accessible on-line or as express classroom style learning. To serve as a complete blended solution to deliver high quality learning to students, with supportive personal facilitators that helps get them qualified to the highest standard quickly. IAO acknowledges that AVPT can deliver on its mission statement. IAO’s international accreditation also recognises that Academy of Vocational and Professional Training Ltd complied with the standards and criteria that meet its quality of education responsibility to its students and to the education profession along with all the services and privileges of regional, national and international professional recognition. “We have a passion for education and using cutting edge mobile technologies that allow us to get people qualified in days not years. 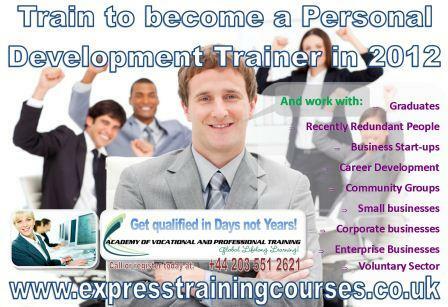 Visit www.expresstrainingcourses.com for more information. We are happy to discuss personal training, scalable training for employers around the world, bespoke on-line courses for organisations, enterprises and networking groups. Have you given much thought about the impression you make? How much leeway do you have to express yourself at work, at home, and via your social media? If you go to the hospital, they are dressed a certain way, the staff may even speak to each other in a certain way. If you stop at most petrol stations, the salesperson is probably dressed quite differently than your physician, and yet still in a way that reflects and supports the business. You go to these people in order to receive a service or a product, and you probably go to them specifically because they have left some kind of impression on you. We refer to this impression as their personal impact. Have you given much thought about the impression that you make? How much leeway do you have to express yourself at work, at home, or even via the social media? While the impact you have can be derived from the way you present yourself (through how you behave and what you wear), we also have to look at ways that reflect your personality and individualism. Have you considered yourself to be a brand, and have your considered how you could strengthen your brand in work, business and socially? When you plan to take a short holiday and ask your neighbor to watch your home for you, what is it that makes you ask that particular neighbor? Are they trustworthy? Friendly? Do they consistently conduct themselves in a way that leads you to think they are a good person? If so, you are feeling some of the impact of their personality. They present themselves in a particular way, and unless you see some demonstration of inconsistency (which may lead you to question their credibility), to you their impact seems quite clear. What kind of impact trail are you leaving behind, What impact do you want to make and leave with others? Just click HERE to tell us what information you would like us to send you. Enrollment is now open and you can register by completing the attached application form or clicking on the workshop link below. We have a series of 1 day hair extension workshops that you might be interested in. You can reserve your place for just £10.00. Just click here for more information. With regards to the techniques, please reveiw a couple of the popular courses and click to review some of the video testimonials. The Integrated weave has become a very popular technique. It is robust, does not damage clients hair. You can see what a student and clients have said about this technique. This technique also includes learning to cornrow professionally. We have a special offer at the moment: Learn five techniques in 2 days. This will help you to become a professional consultant and offer more techniques so you can complete different types of clients. This offer is running at £850.00 and includes your kit. You will need to supply two models for day two who will have to contribute £60 towards their remy hair extension. We also have a overnight travel for £120 if we come to you. Learning five technique would increase the amount of clients you could work with who may have different hair problems. We have trained over 450 girls who are all experiencing positive financial rewards along with the pleasure they bring to solving their clients problems. To take advantage of this special offer please complete the attached application form and email it back to us as soon as possible. When you get to a certain age, blood pressure, and heart problems can become a conern. Sometimes just finding out about simple things that you can observe and do to help keep yourself aware is useful. Fluid systems in the body are notorious for the high level of complexity in their physics. The circulatory system is no different, and it is because of this that there are so many different factors that could affect a person's blood pressure. The rate the heart pumps to the viscosity of the blood itself, blood pressure has influences from multiple factors in the body. These factors may, in turn, be influenced by outside factors such as diet, exercise, disease, or drugs. This is because of this that blood pressure has an even greater number of indirect influencers. There are many different forms of pressure that you should get checked as well as your blood pressure to keep yourself in good health. If this is not taken care of, some of the problems that could be happening may not be found in time for them to be treated correctly. One type of pressure that could be checked is your pulse pressure. This is going to be the change in blood pressure during a single contraction of the heart. There is a way to find the pulse pressure of a person easily. Pulse pressure can be taken into account when there is a problem with your blood pressure. It is a good indicator to some different types of heart problems. I have only just discovered how important pulse pressure is, it is time to talk about how to find out a person's pulse pressure measurements. Normally, the pulse pressure is the systolic pressure minus the diastolic pressure. The following items can calculate it: stroke volume divided by compliance. Stroke volume is the volume of blood pumped out of a ventricle with each beat of the heart, as compliance is the standard regulation of beats. The resting pulse pressure in the average person is 40 mmHg and this could increase up to 100mmHg when a healthy adult is exercising. The numbers out of this range will show a possible health problem and you should talk to your doctor about it as soon as you can to avoid any kind of complications. It is very rare to get a pulse pressure reading of less than 40mmHg. The chances are if you receive one that is really lower than the others, you have just done the calculations wrong. If the pulse pressure is low usually, it reflects a low stroke volume and this means that your heart is not pumping out the right amount of blood that it is supposed to. This could be due to a very serious problem like congestive heart disorder or shock. If your pulse pressure is more than 40 mmHg, usually a reading between 60 and 80mmHg, there are few reasons that this may happen. This is an indicator of stiffness of the arteries, a leak in the aortic valve, and an extra path for the blood to go on from the arteries to the veins, hypothyroidism, or some kind of combination of these. It is something that should be discussed with your doctor if it is higher than average and of course, when you have lower pulse pressure than usual too. Reviewing this I think you also need to be very good at maths! Your customers are booking fewer treatments, those who are turning up are spending less, your weekly cash take-ins is in decline, you have mortgage and rent to pay and costs are going up! You are seriously concerned whether your business will survive 2009. Stop worrying and start planning your survival strategy. Worrying only confuses your mind and stops you from clearly acting on well thought out plans. At a time like this, you might be wondering how on earth am I going to get customers to throw their money at me! (Well the visual thought is quite funny if done literally) At this moment in time, everyone is looking at how they can make the pennies stretch. They still want the high value service at competitive prices. Everyone has not stopped spending, they are just a lot more careful and the business that catches their eye with a witty, strong, honest and effective message will win their custom. If you do the same old thing you will get the same old results. So it is time to be creative. I am going to give you just a few pointers, but the real benefit is from registering for our 5 plan Crash course on 'How to get more customers' from our website. 1. Change your attitude and way of thinking. If you are constantly feeling guilty about the fact that a regular customer or new customer must also be experiencing the credit crunch, then you are buying into the negative cycle which will keep you from being creative and productive. 2. Change the expression on your face. When you spot someone who seems to have a 'far away look', or they appear 'worried' and not up to their usual immaculate perky self, you might always start your sentence off with "Are you feeling OK?" 'You look worried.." You have instantly invited a conversation based on negative experiences, down trodden emotions which will sink both and all parties into a downward spiral of self pity. If a sales rep came in and tried to sell you anything with such a mood, would you buy from them just based on 'feeling sorry for them' NO you would not and neither will any of your potential customers. 3. Remind yourself and evaluate your approach to your clients. Are you using a CARROT OR STICK approach. Most people like the CARROT approach because it is pleasurable, and will avoid the pain of the STICK approach which is spending more money without seeing any additional value. When was the last time you ran towards someone with a STICK so that they could beat you? 4. Boost your personal impact. This is a combination of things such as diet, exercise, personal development, networking with like minded people, changing your appearance, writing articles. All of these will help to stimulate your mental attitude and keep them positive. Never moan in front of staff of clients, encourage them to come up with suggestions and ideas that will benefit all parties. 5. Source FREE courses and reports that can help you understand the current environment and stimulate new ideas into your business. 6. Book yourself onto one day workshops that are practical, informative and with networking opportunity. Don't break the bank, but sometimes owner managers forget to invest in keeping their own knowledge base up to date. Visit www.academy-of-vocational-and-professional-training.org if you would like to purchase a copy of the latest publication on getting started in the hair and beauty business. From time to time we all just want some simple advice about moving our business forward. This blog will introduce a variety of advice, tips and trends. Diane Shawe M.Ed. 2012. Awesome Inc. theme. Powered by Blogger.